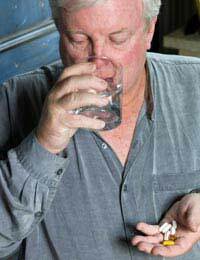 Home > Vitamins & Your Health > Can Vitamin D Prevent Dementia? Dementia is a disease of older people, and symptoms include confusion, memory loss, distress, depression, and in some cases, psychosis. Researchers are looking at the role of vitamin D in different types of dementia. There are a number of different forms of dementia. Alzheimer’s disease is the most common form. The cause of Alzheimer’s disease is not clear, but patients develop amyloid plaques and tangles in the brain. Vascular dementia is the second most common form. It caused by lack of oxygen to the brain. This can be as a result of a major stroke, or a number of very small strokes (this is known as multi-infarct dementia). Vascular disease in the small blood vessels in the brain can also cause vascular dementia. Vitamin D, a fat-soluble vitamin, comes in two main forms – vitamin D2 or ergocalciferol and vitamin D3 or cholecalciferol. Vitamin D is the only vitamin that humans can make themselves, rather than needing to get as part of the diet. It is made in the skin when it is exposed to sunlight, and many people in the Northern hemisphere are deficient in vitamin D, because they do not get enough sun. People who wear clothing that covers the whole of their skin, so cultural or religious reasons, or people who are housebound, may not manufacture enough vitamin D in their skin. As people get older, their skin becomes less effective at making vitamin D.
In a study of elderly people in the USA, published in the July 2010 issue of Archives of Internal Medicine, around half of the people with a vitamin D deficiency also showed signs of cognitive impairment. According to the researchers, people with very low levels of vitamin D were four times more likely to develop cognitive impairments that could develop into dementia. A study in the Journal of Neurology, Neurosurgery and Psychiatry, which looked at European men between the ages for 40 and 79, showed that the people with higher levels of vitamin D did better in memory, speed of recollection, mood and level of physical activity than the people with lower levels. Low levels of vitamin D may also increase the risk of multiple sclerosis, periodontal disease, schizophrenia, Parkinson’s disease, high blood pressure, heart disease, osteoporosis (by limiting the absorption of calcium), asthma, type 2 diabetes and certain cancers, including colon, breast and lung. Vitamin D is also implicated in depression, and dementia is more common in people who suffer from depression, according to a study in the journal Neurology in July 2010. The action of vitamin D in dementia is not completely clear, but it may be by helping clear amyloid from the brain in Alzheimer’s disease, and by maintaining the health of the blood vessels in the brain, reducing or preventing vascular disease. Oily fish is a good source of vitamin D, as is liver, egg yolks, cod liver oil, dairy products, and fortified milk, juice, flour, bread and cereal. To get vitamin D from the sun, spend somewhere between five and 30 minutes a couple of times a week in the sun (just avoid being burned, and wear plenty of sunscreen if staying out in the sun for longer periods).